As the years passed, the Hermanson's farm continued to adapt and expand. 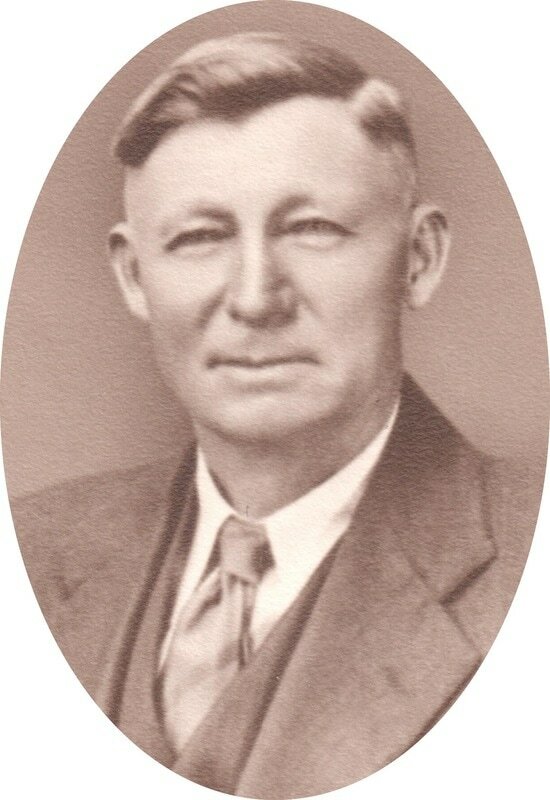 As Peter grew old, his youngest son Walter purchased the family business, primarily farming grain, along with livestock. In 1918, Leonard joined his father in the family business. Leonard pursued a focus in dairy farming, and in 1920, with only 12 cows, started bottling milk. 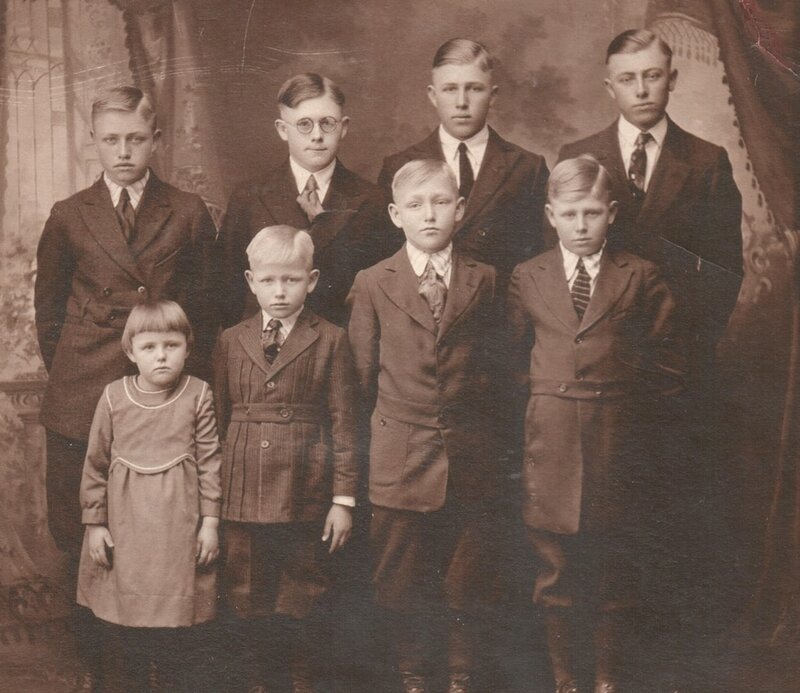 Walter & Nellie's children. Back Row, Left to Right: Theodore, Carroll, Birdsall, Leonard. Front Row: Mildred, Marion, Robert, Edward. As dairy production increased, Woodland Farms began to offer milk delivery services, with routes reaching through Story City and as far as Ames, Iowa. Originally in Story City, dairy deliveries were transported with a horse drawn cart. At Woodland Farms, there were several delivery men including Robert Hermanson, or as he was better known to friends and family, R.C. One might wonder how items like milk and cream were kept refrigerated on a simple horse-drawn cart. Every morning, canvas bags brimming with ice were placed over the milk in the bed of the cart just before R.C. left for his daily route. This helped keep the dairy products chilled until even the last delivery of the day was made. In the winter a charcoal heater was used to keep the milk from freezing. As most farmers are, R.C. was passionate about animals, but especially horses. While R.C. walked from the cart to a customer's front door, his loyal and intelligent delivery horses would inch their way down the street towards the next customer's home in anticipation of the work ahead. Woodland Dairy ad in the Story City Herald. June 16, 1949. Woodland Dairy ad in the Story City Herald. June, 1932. 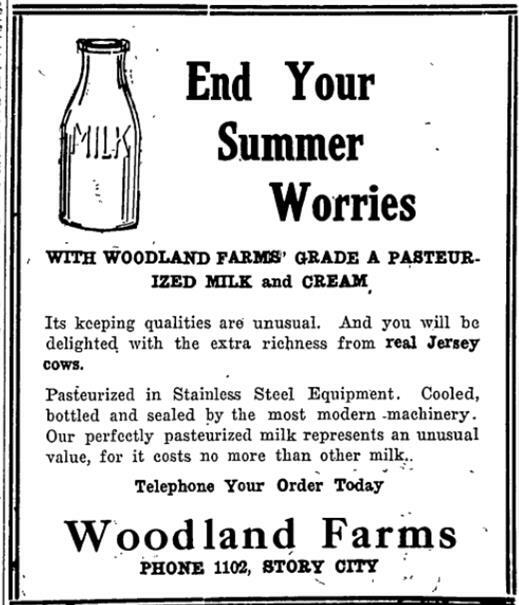 Woodland Farms often printed ads in the Story City Herald to help get the word out about Woodland Dairy. These particular ads were directed towards buyers trying to beat the summer heat. 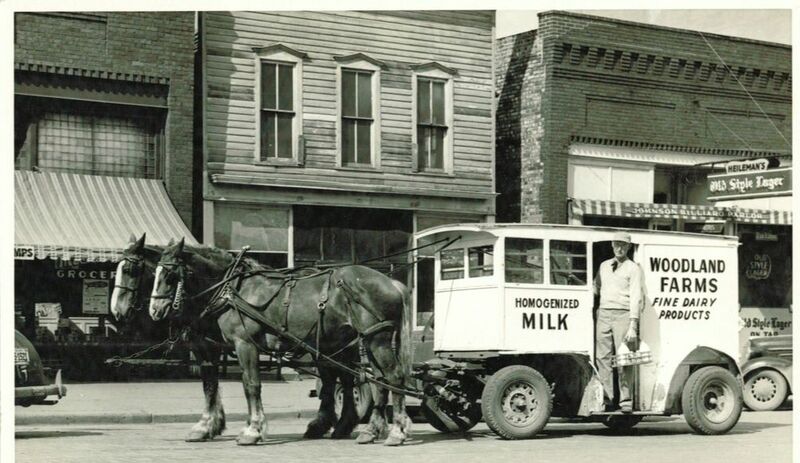 ​​In 1950 Woodland Dairy exchanged their horse drawn carriage for a delivery truck. ​Instead of paying for milk with a credit card, customers would buy a book of tickets and then exchange them for dairy products. Although it was still possible to purchase milk with cash, the ticket system was an easy way for families to budget their grocery spending for the month and did not force the milk man to bring large amounts of cash with him on daily routes. Single families would usually purchase a quart of milk, while places such as restaurants or fraternity houses would purchase gallons. One of the most common questions customers asked early Woodland Dairy delivery men was why Woodland Dairy no longer sold unpasteurized milk. This may seem like an odd question to most Americans today but due to the spread of diseases, the federal government had outlawed the sale or distribution of raw milk in the United States. But in the early twentieth century, some Americans did not trust the process of pasteurizing milk and insisted on drinking it raw. Although Woodland Dairy delivery men did their best to explain that pasteurized milk was harmless and combated the spread of germs, not all customers were easily convinced. 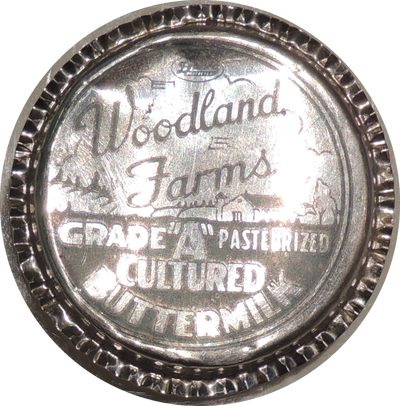 Woodland Dairy offered a variety of products such as buttermilk, whipping cream, table cream, and even chocolate milk. Although the caps changed throughout the years, the quality always remained the same. 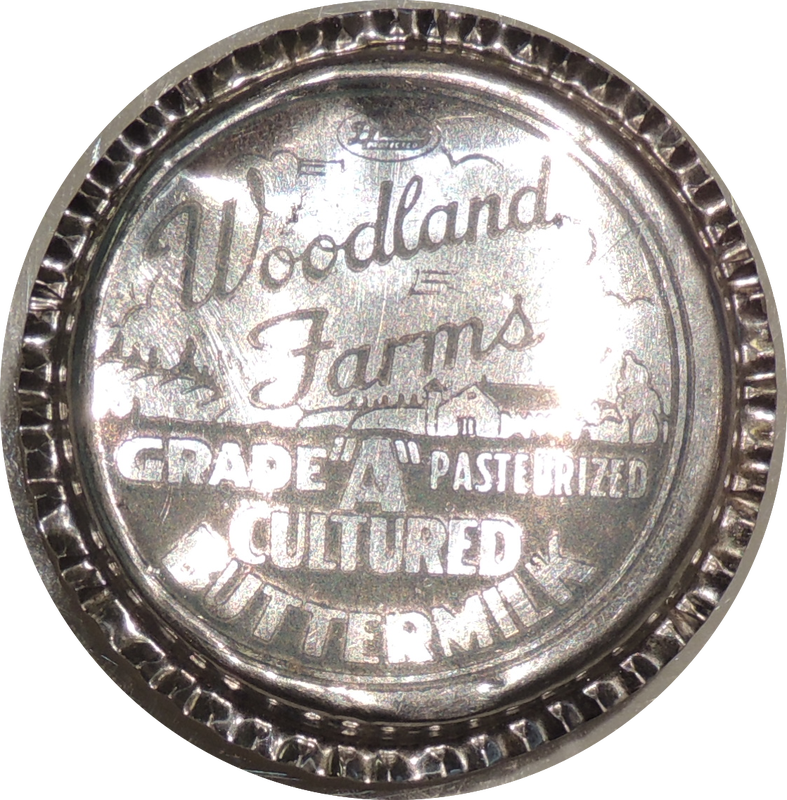 The “Grade A” that is printed on most of the caps informed customers that Woodland Dairy products were fluid tested and produced in standard sanitary conditions set by the FDA. These standards have helped end the spread of bacteria and assured Woodland Dairy customers that their products were not only delicious, but safe to consume. 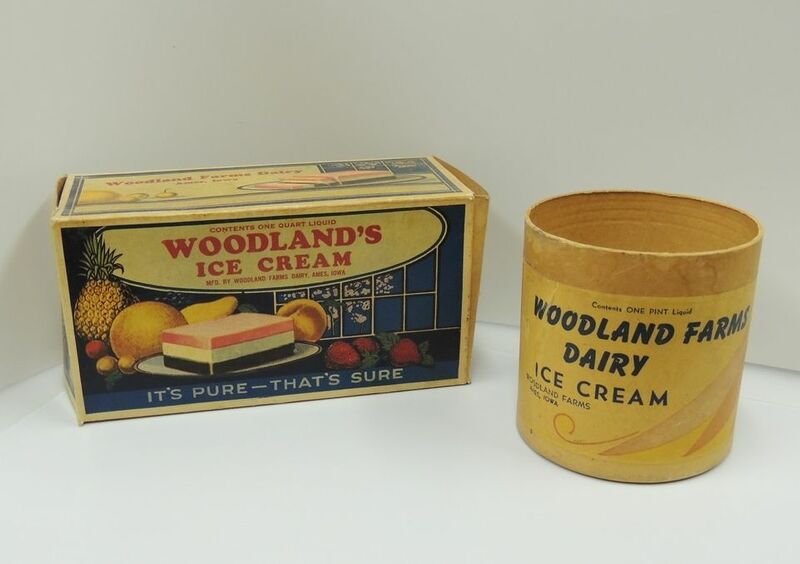 ​Woodland Dairy not only bottled milk but retailed a variety of dairy products including ice cream. 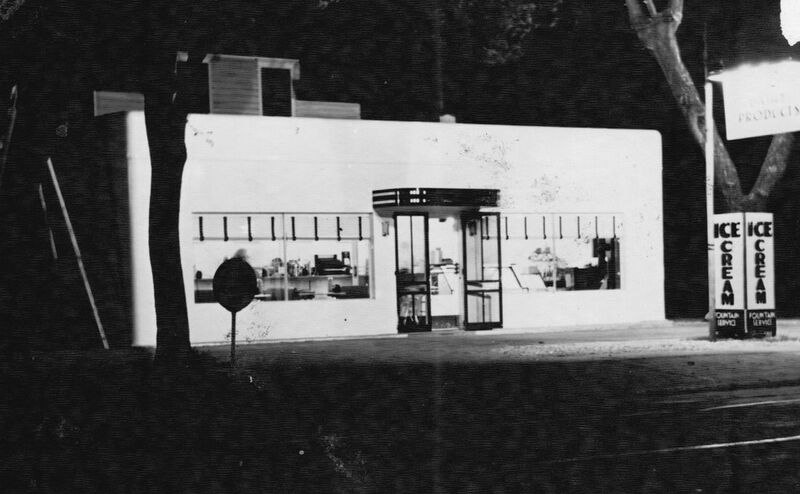 This lead to the opening of a dairy store in Ames in the 1930's. Customers could stop in and order sandwiches, soda, and all the ice cream imaginable. Roger Hermanson, son of Theodore and Mary Hermanson, says he owes a lot to Woodland Farms, not only for the work ethic that accompanies farming, but his father's family began because of it. "Life on the farm for me was a great experience because I learned which end of the pitch fork worked, and if it hadn't been for the farm, my dad would not have met my mother." Ted Hermanson drove the milk truck through Ames, delivering dairy products to homes and businesses alike. One of Ted's frequent delivery stops was the Campus Cafe located near Iowa State's campus. Mary was a waitress at the restaurant and on one of his deliveries, he asked her to ride with him in his dairy truck. They would eventually wed on May 1, 1938. Ted and Mary's eldest son, Walter, would continue his father's work. After working as an insurance investigator for five years, he became the manager of Woodland Dairy. This job included milking the cows, maintaining the dairy facilities, and ensuring production efficiency. Walt even recalled one January when Woodland Farms was short a herdsman, so he had to work double shifts that lasted 12 hours, in order to get the cows milked on time. 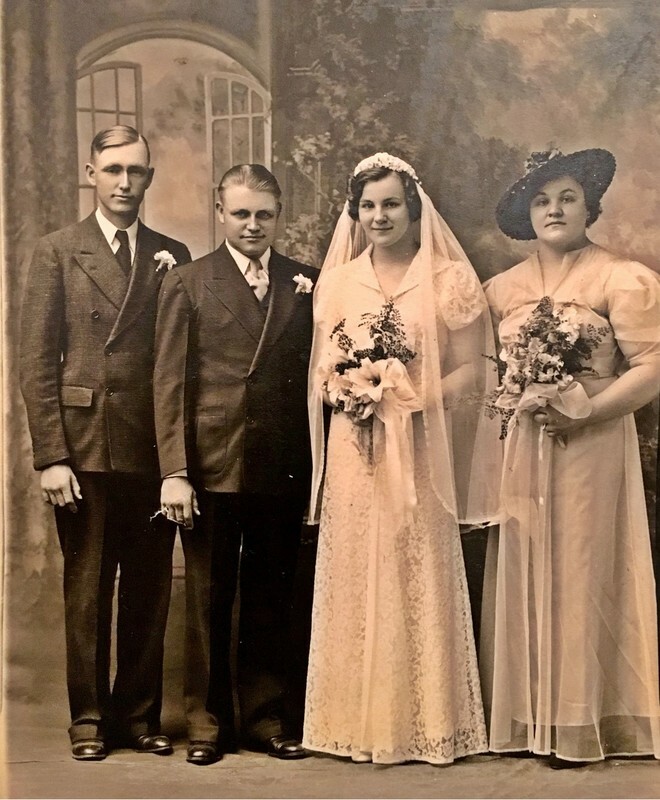 Maintaining tradition has helped Woodland Farms remain in the Hermanson family, all while building bonds between each generation. 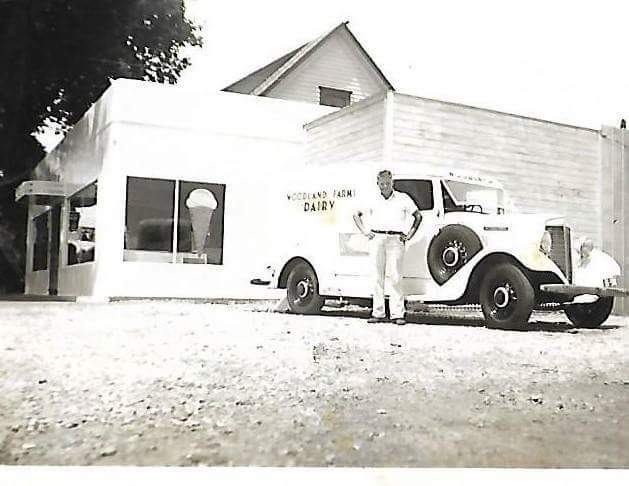 Ted Hermanson outside Woodland Dairy in Ames, 1940. Ted and Mary's house and the Woodland Dairy store in Ames, Iowa. 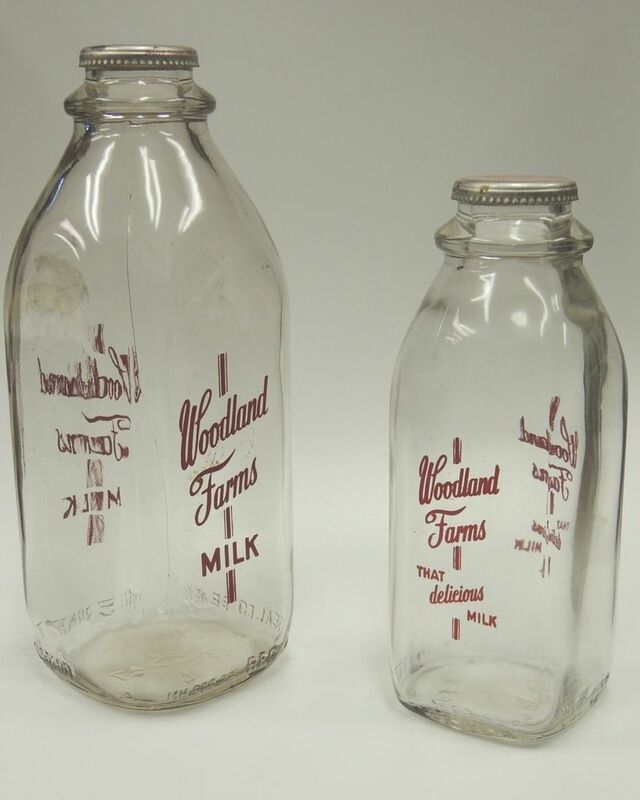 Milk bottling and retail productions at Woodland Farms continued for 30 years before the dairy routes were sold in 1951 and the creamery closing in 1952. In 1998, the Hermansons sold the cattle that made up Woodland Dairy to a farm in Texas.